It is kind of structure made up of trusses for a stage setup. 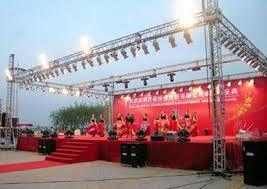 In any musical concert or live event, the sound speakers and lights are hanged on the truss structure. Standard lengths are 5’, 8’ and 10’, however, each box truss can be manufactured in any length to meet custom specifications without the custom cost.